Passivhaus or 'Passive House' is the fastest growing energy performance standard in the world. The heating requirement in a Passivhaus is reduced so that a traditional central heating system is no longer required. The Passivhaus standard is to create a building that has an excellent thermal performance, high comfort levels, exceptional airtightness and mechanical ventilation which results in minimising the 'Heating Demand' of the building. As with our Low Energy architecture, we believe that Passive Homes can be delivered in an affordable way at the time of the build but with the cost savings over a short period of years, the Passive. ventilation system: but not cutting back on comfort. The house itself needs minimal energy to begin with! As with our Low Energy ECOHomes, we believe that Passive Homes can be delivered in a affordable way at the time of the build but with the cost savings over a short period of years, the Passive House pays for itself in no time. Passive housing is effective for any building that uses energy - residential housing, offices, schools, super markets and factories. Super Insulation is one of the crucial aspects of Passive House Design. In a standard build the levels of insulation are only the minimum levels required by Building Control and are not sufficient to satisfy the Passive Standard of between 0.10 - 0.15 W/m2K (also known as ‘U’ Values). Another issue in a standard build is that there is a discontinuity of the levels of insulation resulting in a high level of thermal bridging and air leakage throughout the structure which is not feasible when trying to obtain the passive standard of 15 kWh/m2 per year for energy demand. The insulation levels and resulting ‘U’ values are the starting point of the envelope to for the building performance but is heavily reliant on the other principles to perform correctly. • A Thermal Bridge is created when materials that are poorer insulators (e.g. concrete sills or blocks) than surrounding materials come in contact, allowing heat to flow through the path created. In passive and low energy construction the building is super insulated and thermal bridging is eliminated by careful detailing to prevent heat loss; ensuring the standard is met. • An example of thermal bridging is in the window sill detail. 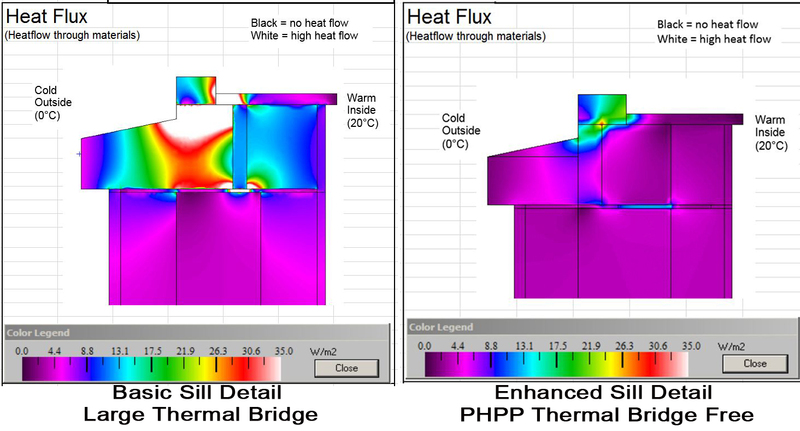 This can be easily seen in the thermal modelling images completed by our in-house team, and shows the dramatic difference in the heat flow between the basic, most common detail on the left and the FmK Thermal Bridge Free detail on the right. • Although by itself, this may not seem a lot, but when multiplied to all the sills in a building along with all the other thermal bridges, this becomes very significant. Another major effect that thermal bridges have is that they cause the surface area at the affected area to be significantly less which promotes mild growth when coupled with high moisture levels inside. Therefore careful detailing is essential but not overly difficult to achieve on site. Airtightness is the control of airflow within a building. This means there is no unexpected air leakage (losing warm air) or no cold air infiltration from the exterior, especially in windy conditions. The Passive House Standard for an air test result is 0.6 Air Changes Per Hour@50Pa air pressure. Compared to the current Building Control requirement of less than 5 Air Changes Per Hour, you can see the enormous difference in air leakage from a Passive House construction and standard construction. This test is carried out with a large fan system and is called the ‘Blower Door Test’. At FmK we offer our clients an intermediate blower door test with our own equipment at the time of applying the air tightness products so that any small leaks can be found and rectified at this time. This is much easier at this stage than trying to find leaks when everything is covered up. Making the house air tight is probably one of the more important and difficult parts of the build but with proper details and training, this is made easier. • Passive House windows need to be twice as efficient as conventional windows and also be positioned to receive the most natural sunlight during the year. Passive house standards require at least triple glazed and use warm edge spacers between the glass panes with low conductivity. 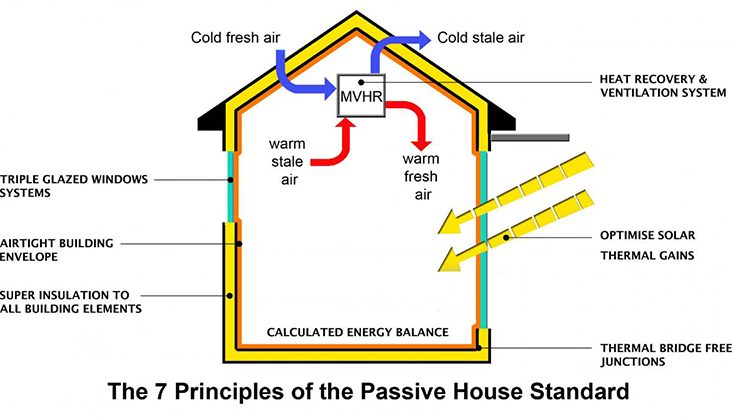 • The Passive house standards state that U-values for windows should be below 0.8 W/(m²K). As a Passive House has an airtight and super insulated envelope, it means that there is a need for ventilation; hence a Mechanical Ventilation Heat Recovery unit is used. A Mechanical Ventilation Heat Recovery unit or MVHR is used to take advantage of these conditions in a passive house; it brings fresh cold fresh air into the house, using the heat from the warm stale air exiting the house to heat up this fresh air. The two air flows never meet so that the incoming fresh air is not contaminated with the outgoing stale air and only the heat is transferred. Most units work on the basis of being around 80 – 90% efficient, so that most of the heat generated in the house is not wasted but recycled into the house. The other main benefit is the constant supply of fresh, filtered air within the building without the need to open windows. Solar gain is a important principle of Passive House design. Passive The sun’s energy to create a comfortable internal environment; as the sun’s energy provides most of the light and heat that is required..
Orientation is the main element involved in maximising solar gain.. As the main sunlight comes from the south, so the south facing facade of the building should have maximum glazing whilst glazing on the north facade should be kept to a minimum. Large areas of glazing on the south façade can also however lead to overheating, so in some cases, shading to the glass is required for mid-summer sun and can come in the form of brise soliel or overhangs. The calculated energy balance is done using all the elements above and formulating them using the PHPP (Passive House Planning Package). This package evaluates the performance of each element, whether it is the external fabric or the ventilation system and provides the overall Heat Demand that the building is using at that time. As a Passive House requires a maximum Heat Demand of 15kWh/(m²a). Using the package, elements can be adjusted to get to this figure; for example if the figure is at 16, an increase in insulation thickness to some element of the build could push this down to below the 15 level required. 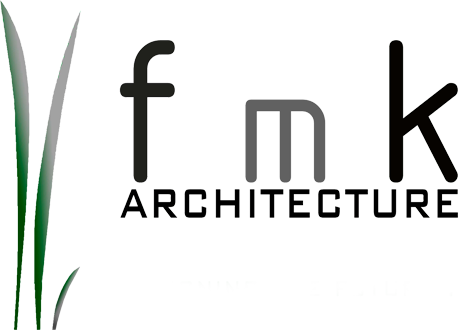 The planning package gives a very detailed breakdown of the building fabric and allows full control and manipulation of the construction to get to the end result of 15kWh/(m²a). Copyright © 2019, FmK NI. Theme by Devsaran.